Jan Covey has been enjoying living full time in the Greenwater area since 1989 when she moved into her home at Crystal River Ranch. The strong sense of community, the abundance of natural beauty along with the variety of outdoor activities available make Greenwater the place to be for her. Crystal Mountain Ski Area has been a part of her life since she was riding around in the Snow Cats with her father who worked at Crystal in the early 60's, to teaching at Crystal Mountain Ski School in the early 80's up to present skiing for re-creation. . . . as much as possible. 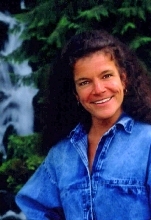 Jan has been a licensed Massage Practitioner for Washington State since 1990. For 17 years she worked at a local chiropractic office and now does her work traveling to her clients homes. Along with all the outdoor activities, she enjoys home and health including cooking, entertaining friends, campfires, guitar, sewing, gardening and pets; not to mention in the summer time the "Swimming Hole"